The winner of the first Change by Doing contest is Brodie, from Los Angeles. Woot Woot (If I weren’t so vehemently against emoticons, I’d insert something here that winks or smiles or dances a jig). 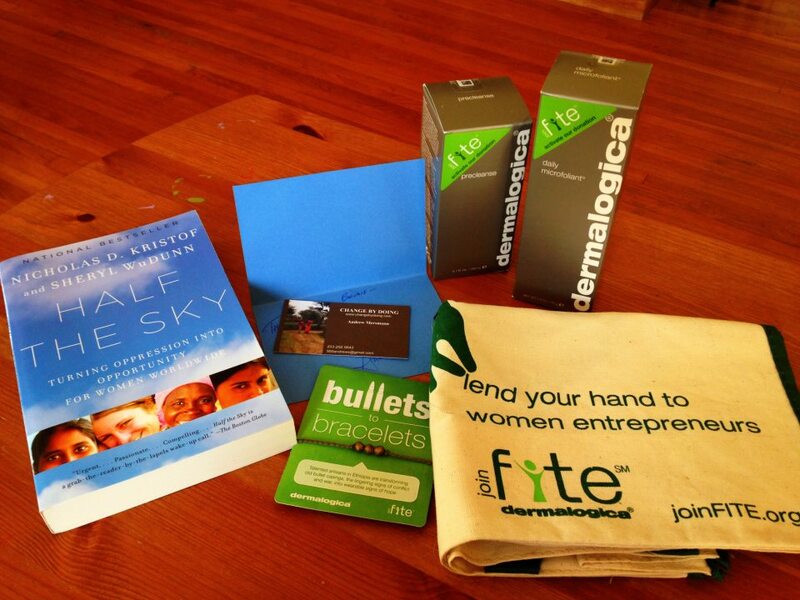 Brodie won skincare products from a new line at Dermalogica, Nicholas Kristof and Sheryl WuDunn’s Half the Sky, a canvas tote bag, and a “Bullets to Bracelets” Ethiopian artisan created work made from old bullet casings melted down into beads. All he had to do was respond to this question: If you could custom design a dream volunteer vacation anywhere in the world and tackle any problem, where would it be and what would you do? Brodie wrote: “I’ve always been attracted to ancient European historical towns that still operate much like they did hundreds of years ago. And in many of these towns, architectural masterpieces are falling to ruin. It’s not that the towns aren’t thriving, it’s just that the cost of restorations are often prohibitive for these small communities. A great volunteer vacation would be helping to restore these towns to their former glory. Medieval churches, historical homes, and cobblestone streets would flourish again. The benefits would be countless because when history comes alive, it brings us all together. You’d be hard-pressed to find a more devastating look at life than the situations faced by women around the world in Half the Sky, by NY Times husband-and-wife team Nicholas D. Kristoff and Sheryl WuDunn. You’d also be hard-pressed to find a book I could recommend more highly. It is required reading as far as I’m concerned. You will be shattered. You will be gutted. You will also be incredibly inspired and, if you’re anything like me, jumping out of your skin wanting to find a way to help. The problem of gender-based inequality in all it’s brutal forms, is so ingrained in so many societies that hold themselves down by their actions in the name of gods or history or simply the way it has always been done. This is no man-bashing tome making men villains, though there is often cause to do so. It is a tour through widely varied cultures and societies, getting to know local girls and women as individuals (the authors cite important studies that show people get overwhelmed by statistics, but respond to individual stories–opting to help one person over helping dozens or hundreds). The big picture is examined here alongside individual lives. The magnificence of the human spirit in answer what faces so many of these women blows the roof off your own limitations. And the ease with which we can help–truly help–and truly make a difference will make you wish you had read this ages ago–even though it made you cry and a little sick to your stomach to do so. But please do read it.